Zoom has been SMU’s video conference system of choice for a couple of years now, and plenty of you have taken advantage of its ease of use and stellar call quality. Recently, Zoom released an update to their desktop client, and here are some highlights of what’s new! Before, Zoom would display in multiple separate windows, which could sometimes get cumbersome when switching between different programs. 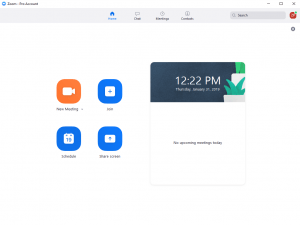 Now, Zoom is contained in one consistent window so you can access meetings, contacts, and settings all in the same place. Chat – Keep the Conversation Going! The chat feature has been expanded to allow you to chat with your contacts outside of actual meetings. You can create one-on-one chats or channels for specific groups to share information. This makes Zoom behave more like the IM features in Skype for Business or other Instant Messaging platforms. Speaking of contacts, Zoom now allows you to browse all SMU contacts that utilize Zoom directly within the application. This contact list behaves much like the Global Address List in Outlook. You can then add contacts into channels to quickly start chat sessions or entire meetings in a snap. If you’re curious about how Zoom can help you harness the power of video conferencing, you can always contact the IT Help Desk. Also, Zoom provides excellent documentation on their website as well as live webinars every week for multiple topics.